Hollis JohnsonSubmitting a sample for a DNA test. Genetics testing company 23andMe can now tell you about your breast cancer risk – at least based on three mutations found on the BRCA1 and BRCA2 genes. Genetic counselors who help people navigate tests like those that determine your cancer risk have concerns about how those who have taken the test will interpret their results. 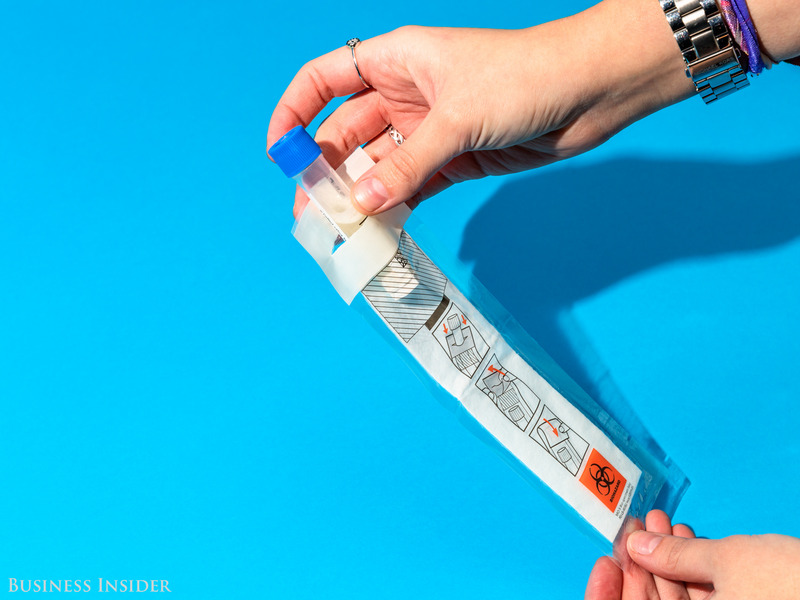 Here’s what those experts would like you to know about what the test does – and doesn’t – tell you about your breast cancer risk. The FDA on Tuesday gave the OK for 23andMe to provide a breast cancer risk report without a prescription. That makes 23andme the first direct-to-consumer genetics test allowed to provide some information about your genetic risk for cancer, specifically around three mutations to the BRCA1 and BRCA2. Typically, cancer genetics tests require a doctor’s prescription, and they tend to go more in-depth than these three mutations. 23andMe’s test costs $US199 for both the ancestry and health components. After ordering, 23andMe sends you a test kit with a saliva collection tube, which you then send back to the company’s labs. From there, the tube’s contents are analysed, and 23andMe provides you a wide range of reports from information about your ancestors to information on how you metabolize coffee, along with other health risk reports for conditions like celiac disease and Alzheimer’s disease, so those are included in the test as well in addition to your BRCA risk. 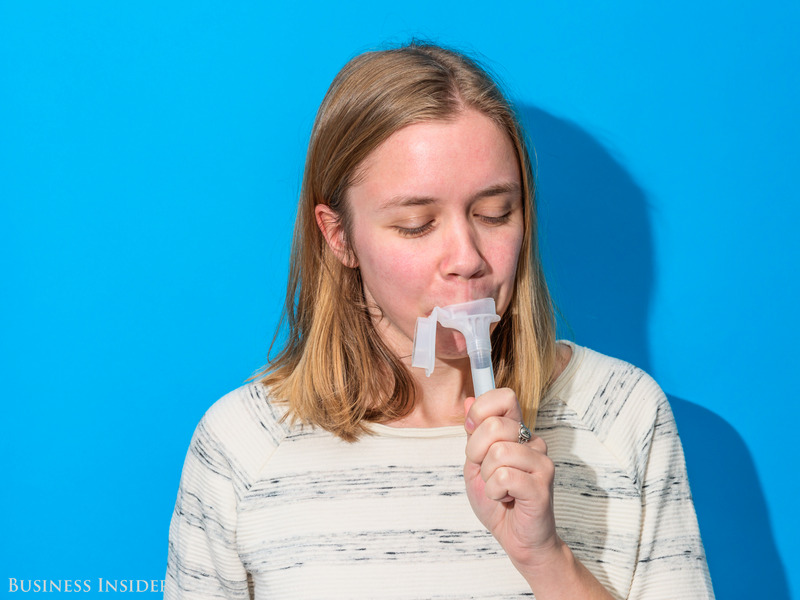 “Worrying about the many current 23andMe customers who have one of or more of these variants has caused me sleepless nights,” 23andMe CEO Anne Wojcicki said in a blog post on Tuesday. But genetic counselors, who help people navigate tests like those that determine your cancer risk, already have their concerns about the newly-approved test – mainly around how users will interpret the results. 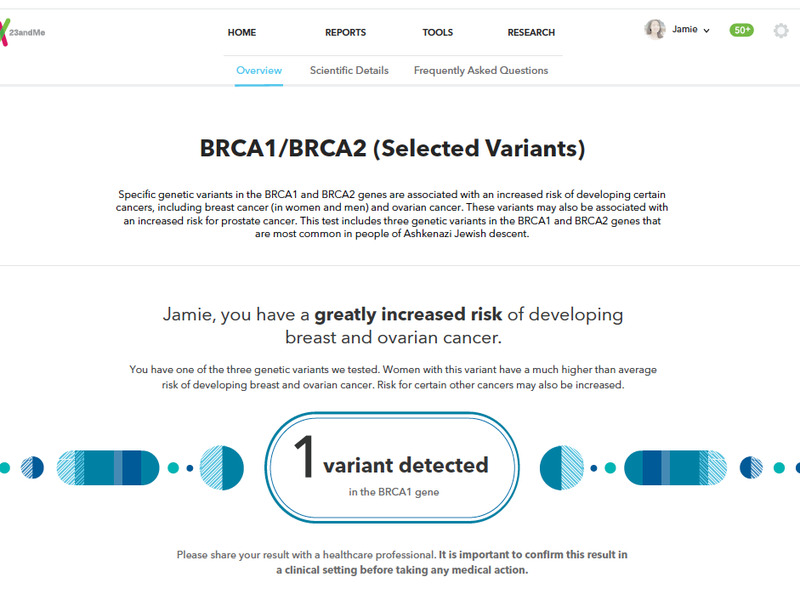 23andMe’s test is looking specifically at mutations to the BRCA1 and BRCA2 genes, which are connected with an increased risk of breast and ovarian cancer in women, and breast and prostate cancer in men. The three BRCA mutations 23andMe analyses are most commonly found in people of Ashkenazi (Eastern European) Jewish descent. That’s the group this test will be especially useful for. “If you are not of Jewish background, this test has very little utility for you,” former National Society of Genetic Counselors president Mary Freivogel told Business Insider. BRCA1/2 have thousands of mutations that can mess up how the genes work. So even if someone doesn’t have one of the mutations, they could still carry another mutation that the test doesn’t include. The presence of a mutation doesn’t necessarily mean you have cancer, just that the chances are higher. For example, in the US, the average woman has a 7% of chance of getting breast cancer by age 70. That escalates to a 50% if the woman has a mutation to her BRCA 1/2 genes. Knowing whether you have a mutation could get a conversation started with health care providers to see what kind of additional tests you should take and what kind of preventive measure should happen next. Kathy Hibbs, chief legal and regulatory officer at 23andMe, told Business Insider that these three mutations are among the most well-defined when it comes to the BRCA1 and BRCA 2 genes. Should someone have a family history of breast cancer, they might want to take a more comprehensive, doctor-ordered test that looks for more mutations in the BRCA1/2 genes, along with other genes associated with cancer. “The point of our product is to give individuals a broad screen,” Hibbs said. After that, if a deeper screen is needed, the user can choose whether to get their doctor involved. Here’s what the report looks like if you have one of the mutations 23andMe tests for. Having genetic mutations linked to hereditary cancer risk can be incredibly crucial information. Because there’s such a higher risk of getting cancer for those who have mutations, there are a number of ways to intervene, including surgery to remove breasts and ovaries. She recounted an instance when one of her friends in her mid-20s asked her doctor if she should be getting regular breast cancer screenings because she had a family history of breast cancer. Her doctor suggested a DNA test, which came back positive. At that point, her doctor started asking questions Freivogel’s friend wasn’t entirely prepared to answer, such as discussing a preventive mastectomy and asking if she planned to have kids soon because she may need to have her ovaries removed. 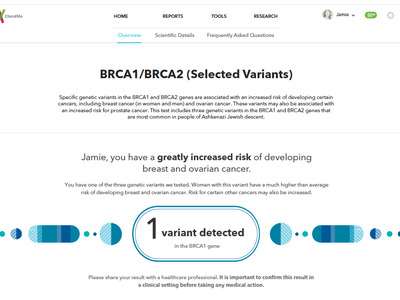 Before 23andMe users can view their results for BRCA1/2, they have to complete an educational module, which should help set some of these expectations. Like with 23andMe’s Alzheimer’s and Parkinson’s disease reports, users have to opt-in to receive the reports during the ordering process and once they get the results. There’s also the concern of what happens if someone gets a result that’s negative for the three mutations tested. For example, I asked Freivogel if I should view my results, knowing that I’m of predominantly Scandinavian descent and not of Ashkenazi Jewish descent and likely won’t test positive for the results. She told me it probably wouldn’t be worth it. Her bigger concern is that if someone of Scandinavian descent tested negative but did have a family history of breast and ovarian cancer, they might not fully understand that they still could have a mutation, just not in the three tested. Myriad Genetics, a company that provides BRCA1/2 testing through doctors, shared the concern of a false-negative result from direct-to-consumer (or DTC) tests. “We have concerns that DTC tests designed to evaluate only a tiny fraction of the genetic causes of hereditary breast cancer could cause harm to patients by inducing a false sense of security associated with a negative test,” Myriad Genetics spokesman Ron Rodgers told Business Insider in an emailed statement.